I have a passion for fitness and living a fit lifestyle. I believe in teaching clients how to live a healthy lifestyle with sound nutrition and rigorous workouts. The training programs I design will represent the most intense workouts a given client can handle, with emphasis placed on safety. The emphasis I place on client education is so that after working with me client will be able to independently continue towards their new goals. I grew up involved in youth hockey and golf. I learned to love the weight room at a relatively young age as I saw that performance in the gym improved my life elsewhere. I attended school at the University of Michigan where I continued my ice hockey career for a single year before deciding to focus solely on academics. After attaining my bachelors degree, I served in the United States Marine Corps. While serving, I became a Master trainer through ISSA and led my regiments Body Composition Program. This was my first experience of teaching others to live healthy and seeing the changes in their lives motivated me even more - I was hooked. My time in the corps came to an end with an injury that required 25% of my upper leg to be me removed. Recovery was a long, arduous process; but, having my fit lifestyle threatened only caused me to have more respect, gratitude and passion for health. 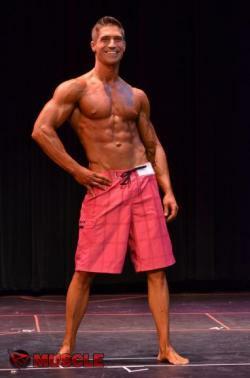 I was able to make a full recovery and am currently competing at the pinnacle of the amateur physique ranks. I live both for fitness and because of fitness... and it is this passion and knowledge I have gained on my path that I share with others.